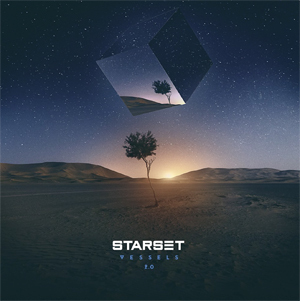 Visionary media collective STARSET have released Vessels 2.0 on September 28. The band has shared the suspenseful new video for the epic reworking of "Bringing It Down (Version 2.0)". Watch it on KNAC.COM HERE. The deluxe version of last year's sophomore effort Vessels includes reimagined, acoustic, and remixed versions of songs, along with an unexpected cover, for a total of nine new tracks. See track listing below. Vessels 2.0 is the expanded edition of the band's Fearless Records debut. In addition to the digital release, a 3-LP deluxe vinyl will also be available. Vessels has proven to be a watershed moment for STARSET. Upon release in January 2017, it debuted at #11 on Billboard's Top 200 chart, while the first single "Monster" was the second most played song of the year at rock radio. Since then, the album has been streamed 100 million times. Additionally, the band's slate of YouTube videos have amassed over a billion cumulative views.